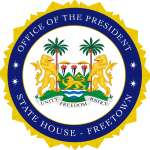 State House, Freetown, Tuesday 13 November 2018 – The newly approved commissioner of the Public Service Commission, Madam Doreen Faux, subscribed to the oath of office in accordance with Section 151(8) of the 1991 Constitution of Sierra Leone. The said section states that: “A member of the Public Service Commission shall, before assuming the functions of his office, take and subscribe before the President the oath as set out in the Third Schedule to this Constitution”. Shortly after her swearing-in ceremony at State House, Madam Faux said she was honoured and delighted to have been appointed to serve in the new government and commended President Bio for the confidence reposed in her to serve the country. She added that she was ready to help, as a team member, to ensure that the goals and objectives of the commission were achieved. On his part, His Excellency President Julius Maada Bio said: “I thank you for accepting to work. The New Direction is founded on the basis that things have not gone well and that we need to go in a new direction to make things work. Therefore, we want to change the way things work by changing the methodologies of how things have been done and by building the spirit of teamwork. You may not agree all the time but you have to disagree to agree in the best interest of our nation. I wish you the best tenure of office,” he ended. The Public Service Commission was established in 1948 by the Constitution of Sierra Leone with the mandates to appoint persons to hold or act in offices in the Public Service including the power to make appointments, promotions and to exercise disciplinary control over persons holding or acting in such offices.